- Where you can buy a new horse? 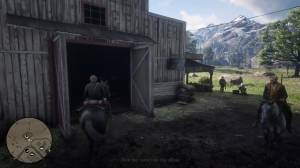 - Where to sell horses? Where you can buy a new horse? Stables are one-stop shops for your horse’s needs. You’ll be able to use any stable in the region during the story mission Exit Pursued by a Bruised Ego. Your horses can be conveniently managed in all stables in the region. Stables are open 24/7 to attend to your needs. You can buy new horses from stables, with high quality breeds costing a considerable amount of money. You can only keep up to four horses, one that you’ll be using and 3 stable slots. 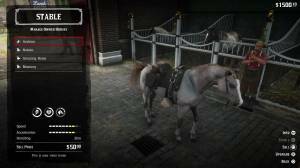 There’s no way to increase these slots so you’ll have no choice but to sell your other horses to make way to new ones. The amount the horses can be sold for will depend on their breed and bonding level. You can sell any horse on any stable in the region though you’ll get more money by selling them via a specific fence in Clemens Point. You can unlock this fence by completing the mission “Horse Flesh for Dinner” in Chapter 3. Horses don’t usually sell much unless you sell bonded and rare breeds, which takes time and effort to be considered as a source of income. In case your stable is full and you bring in a new horse, you’ll be given a choice to sell the new horse immediately or sell one of your stabled ones. This includes stolen or tamed wild horses. However, this will usually be cheaper than bonded or owned horses since they “don’t have proper papers”.